As a direct response copywriter, my goal is to help you generate additional revenue and profit by improving conversion. Using proven direct response copywriting techniques, I help companies improve conversion—often beating established controls. My services are an excellent fit for many decision makers in the direct response business. However, I don’t claim to be everything to everyone. To see if we’re a good match, please read below. Want the highest level of direct response copywriting. Are completely upfront about pricing and you run a totally ethical business. Measure response and expect the copywriter to help you improve conversion. Understand that direct response copywriting is an investment. Expect the copywriter to perform all the steps necessary to maximize response. Are completely dedicated to direct marketing. Can provide a clear, organized, and fact-filled creative brief—or point me toward the research. Like to receive several different elements to test. Have strong traffic and/or highly targeted lists. Can provide me with enough time to complete a project—although I can provide ‘emergency’ service. Have an adequate budget for top-level copywriting. Expect the copywriter to meet deadlines. Fully understand the demographic and psychographic of the potential client or customer. Expect the copywriter to communicate, ask questions, and provide creative ideas. Want the copywriter to take ample time to get the copy correct the first time. You're looking for a Dan Kennedy Certified Copywriter for Info-Marketers. Your business model includes 'bait and switch' or similar tactics and techniques. I ONLY work with companies that take a totally transparent approach to offers and pricing. If you resort to 'small print' to hide the real pricing and obligations, please choose another copywriter. You need branding copy. 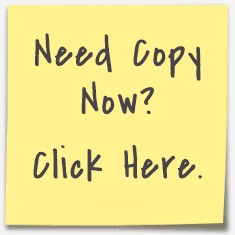 I can write this type of copy but I prefer to write copy that sells. You expect top-level copywriting for a bargain price. You don’t track response and don't expect the copy to sell a product or service directly. If you believe we’re an excellent fit, please contact me here and let’s get started.